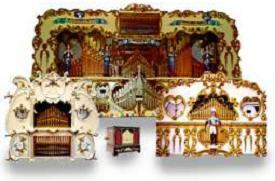 Dean Organ Builders manufacture and restore mechanical musical instruments (barrel organs, fairground organs etc). Our Speciality is mechanical pipe organs playing by perforated cardboard book music. Our new organs are manufactured in the traditional pneumatic way using only the best of methods and materials. Please browse our website to view our products & services fully. Gavioli 112 keyless music. Any condition. If you have some old music stored at the back of the shed, why not dig it out and contact us. It does not matter if it's falling to pieces we may be interested to purchase it. Tel : Richard Dean 01275 832840.